Texture coated blue blade keeps debris from sticking, prevents rust corrosion. Edge grind makes it easier to dig in harder soils and materials. Two rivets in 11" socket keep handle securely attached. Industrial 14-gauge blade. #2 blade with 48" ash handle. 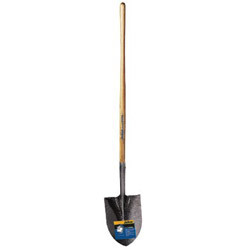 Tool Type: Spade; Application: Farming; Gardening; Landscaping; Applicable Material: Clay; Gravel; Sod; Soil; Style: Round-Point Digging Shovel. Shovels, Spades and Parts from Jackson Professional Tools! 94 In Stock today.